British Standards are the standards produced by BSI Group which ‘Set up standards of quality for goods and services, and prepare and promote the general adoption of British Standards’ (Wikipedia, 2015). In relation to furniture and upholstery there are a number of British Standards which must be observed. Furniture standards and regulations worldwide, such as BS 4875 (structural testing of domestic and contract seating), impose strict flammability testing for fabrics used in the upholstery process. flammability testing is increasingly important, with the effects of different tests (match, cigarette, crib 5 and crib 7) showing the effects of different ignition sources on fabrics and fillings as specified in the many aspects of BS 5852. Over time and use, these test names have been abbreviated in the furniture and upholstery industry to ‘cigarette & match’, ‘Crib 1’, ‘Crib 5’ etc. and are therefore commonly simply referred to as ‘Source 5’ or ‘Crib 5’. A smouldering cigarette is used as an ignition source. A match or equivalent gas flame, using 45ml of butane gas from a burner, is used as the ignition source. A gas flame, using 350ml of butane gas from a burner, is used as the ignition source. A wooded crib, made of dry wood stacked in a lattice formation weighing 17g, is used as the ignition source. According to Fr-one.com the wooden crib is composed of small ‘wooden planks, glued together’ akin to Jenga blocks. The crib is placed on the test rig and ignited with a match. If no flaming or progressive smoldering is observed on both cover and interior material, the test is recorded as ‘no ignition’ and the material passes the test. British Standard indicate that the size of the Crib vary depending on the test and are conducted within specified temperature and humidity ranges. Each test is conducted in duplicate and both tests must satisfy the pass/fail criteria in order to comply with the test requirements. 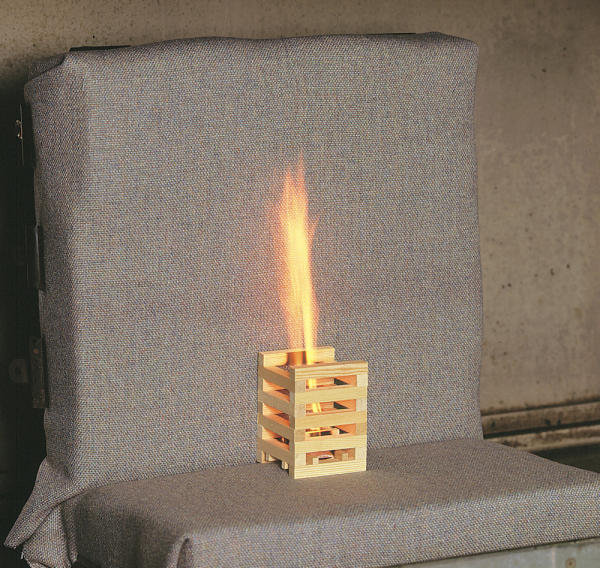 Typical pass/fail criteria for Crib 5 include escalating flaming, flame passing through the full thickness of the fabric or any fabric that continues to flame 10 minutes after igniting the crib. Wikipedia, (2015). British Standards. [online] Available at: http://en.wikipedia.org/wiki/British_Standards [Accessed 20 Apr. 2015]. Fira.co.uk, (2015). FIRA – Technical Information – Registered Article. [online] Available at: http://www.fira.co.uk/technical-information/article/32/how-is-ignition-resistance-measured [Accessed 20 Apr. 2015]. British Standards (2006) BS 5852:2006 Methods of test for assessment of the ignitability of upholstered seating by smouldering and flaming ignition sources. London. Fr-one.com, (2015). FR Fabric Standard | British BS 5852 source 0, 1, 5 (Cigarette, Match) and (Crib 5). [online] Available at: http://www.fr-one.com/en/standard/british-bs-5852-source-0-1-5-cigarette-match-and-crib- [Accessed 21 Apr. 2015]. Satra.co.uk, (2015). Spotlight – Upholstered contract furniture flammability. [online] Available at: https://www.satra.co.uk/spotlight/article_view.php?id=289 [Accessed 30 Apr. 2015]. YouTube, (2015). Ferco Seating Crib 5 Seat Fire Test. [online] Available at: http://chieftainfabrics.com/24 [Accessed 21 Apr. 2015].